2017 was a year of innovation in healthcare, and that innovation has meant one thing: more data. In fact, some have suggested that more data has been created in the past year than in all previous years combined. So while last year was focused on capturing as much data as possible, the focus going forward should be on drawing insights from that data - not just within your own health information system, but from across the entire care continuum. This may (or may not!) come as a surprise, but one of the biggest challenges that healthcare facilities are still facing is having access to the data that is already in their own systems. Massive amounts of useful data are being collected by hospital systems by the second- and not just within the EHR. The average American hospital has more than 80 IT systems, and that doesn’t include the IoT (Internet of Things) holding even more data. That doesn’t even take into account IDNs and clinically integrated networks that bring multiple hospitals and facilities together. When each hospital in a network is equipped with those 80 IT systems, totals end up equating to hundreds of systems, all connected, if they are connected at all, by standards that were designed to connect 2 systems to each other, not 80. If these organizations were given real-time access to all of the information being created and were able to access that information from one place, the impact that providers would see in their everyday clinical care, decision support, and actionable analytics (like gaps in care) would be huge. Instead of opening 80 screens to view 80 different information structures (that’s a joke! ), they could open one screen and view information in real time. Furthermore, once we learn how to unlock the data that already exists in our own systems, we’ll be better equipped to connect and share that data in a meaningful way. While our industry’s interoperability challenges may come as no surprise, the solution to our information sharing woes may be equally as familiar; yes, I’m talking about HL7 FHIR (Fast Healthcare Interoperability Resources). Over the last few years, since FHIR development began in 2011, FHIR has been used to begin to address the challenge of accessing an organization’s own data. The standard allows organizations to use their own data within existing workflows, improving both care quality and efficiency for care teams. The first and most important aspect of FHIR is that it’s FAST - fast for both developers to learn, as well as to build interfaces and mobile applications around. Before FHIR, previous standards and technologies could solve the problems that FHIR addresses, but they were prohibitive in cost, resources, and time spent and required all that effort to be duplicated when connecting equivalent systems in another organization. New and innovative implementations of FHIR are already starting to evolve. Take mobile connected health, for example. While the technology that underlies FHIR is nothing new, it is being enhanced by newer healthcare tools, like voice activation. When integrated with voice recognition capabilities like what is currently being piloted with Alexa, FHIR will actually make the application smarter. If these applications can know the context of a question being asked, Alexa or Siri (or whoever it may be) can be much more specific and valuable in the care setting. For example, providers would be able to streamline having to manually search for what medications a patient is taking via FHIR-enabled access to a medication list. They would even be able to cut down on administrative tasks, like appointment scheduling, by combining voice recognition with FHIR scheduling resources across organizations. In this and many other ways, FHIR can start to reduces the burden of existing health IT systems on providers. FHIR is also opening the door to an influx of patient-generated data, which can be anything from at-home blood pressure readings to food journals. The key to deriving value from this type of data, however, is effectively integrating it into health information systems. EHR systems were not built to integrate patient-generated data, so in order to make this information useful, there would need to be a processing layer to integrate the data from the patient to the system. The technology beneath FHIR has solved these exact problems in other industries and is starting to do the same for healthcare. The future for this type of processing layer in healthcare may still be a bit up in the air, but the potential it has for patient-generated health data is huge. Interested in hearing more? 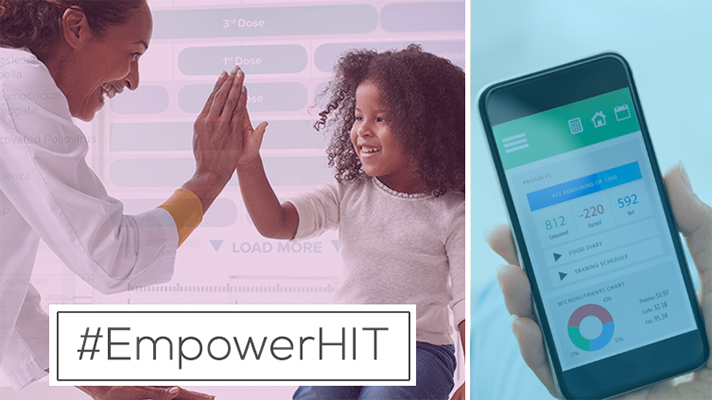 Join me for the #EmpowerHIT Twitter chat with Healthcare IT News Editor-in-Chief Tom Sullivan (@SullyHIT) on January 25 from 12-1 CST to continue the conversation around the future of interoperability and its role in enabling next-generation care delivery.